Thaw fish, if frozen. Rinse fish and pat dry with paper towels. For stuffing, drain broccoli, pressing out excess liquid. Combine egg, half of the cream cheese, and the Parmesan cheese. Stir in broccoli and stuffing mix. Spoon one-fourth of the stuffing onto an end of each fillet. Roll up, securing rolls with wooden toothpicks. Place fish in a greased 2-quart square baking dish. 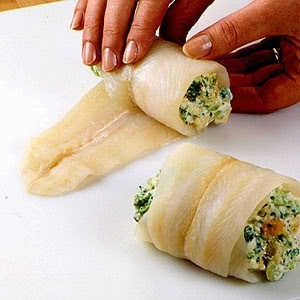 Bake, covered, in a 350 degree F oven for 30 to 35 minutes or until fish flakes easily with a fork and stuffing is hot. Meanwhile, for sauce, in a small saucepan cook remaining cream cheese, milk, and wine until heated through, stirring often. Serve sauce over fish.